Hillbilly Elegy is a passionate and personal analysis of a culture in crisis?that of white working-class Americans. The decline of this group, a demographic of our country that has been slowly disintegrating over forty years, has been reported on with growing frequency and alarm, but has never before been written about as searingly from the inside. J. D. Vance tells the true story of what a social, regional, and class decline feels like when you were born with it hung around your neck. The Vance family story begins hopefully in post-war America. J. D.’s grandparents were "dirt poor and in love," and moved north from Kentucky’s Appalachia region to Ohio in the hopes of escaping the dreadful poverty around them. They raised a middle-class family, and eventually their grandchild (the author) would graduate from Yale Law School, a conventional marker of their success in achieving generational upward mobility. But as the family saga of Hillbilly Elegy plays out, we learn that this is only the short, superficial version. Vance’s grandparents, aunt, uncle, sister, and, most of all, his mother, struggled profoundly with the demands of their new middle-class life, and were never able to fully escape the legacy of abuse, alcoholism, poverty, and trauma so characteristic of their part of America. Vance piercingly shows how he himself still carries around the demons of their chaotic family history. 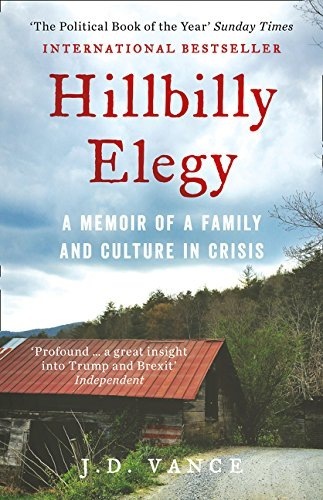 A deeply moving memoir with its share of humour and vividly colourful figures, Hillbilly Elegy is the story of how upward mobility really feels. And it is an urgent and troubling meditation on the loss of the American dream for a large segment of this country. Dopo aver letto il libro Hillbilly Elegy di J.D. Vance ti invitiamo a lasciarci una Recensione qui sotto: sarà utile agli utenti che non abbiano ancora letto questo libro e che vogliano avere delle opinioni altrui. L’opinione su di un libro è molto soggettiva e per questo leggere eventuali recensioni negative non ci dovrà frenare dall’acquisto, anzi dovrà spingerci ad acquistare il libro in fretta per poter dire la nostra ed eventualmente smentire quanto commentato da altri, contribuendo ad arricchire più possibile i commenti e dare sempre più spunti di confronto al pubblico online.